Cramer & Anderson attorneys and staff are participating for a third year in the Danbury Ride of Silence as a way of remembering and honoring the firm’s late Partner David P. Burke. This year’s ride is May 16. This year’s Danbury Ride of Silence poster. Attorney Burke was cycling near Bantam Lake on Route 209 in Morris on the morning of March 12, 2016, when his bike hit a pothole and he was propelled into a guardrail. He was flown by Life Star helicopter to Saint Mary’s Hospital in Waterbury, where he died March 15, 2016, his 63rd birthday. “Cramer & Anderson started participating shortly after David Burke’s passing to honor him and others,” said Partner Kim Nolan, who is coordinating the firm’s participation in this year’s ride. 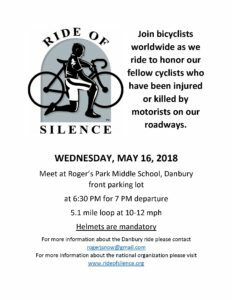 The Danbury ride, hosted by the group Bicycle Advocacy of Greater Danbury, covers approximately five miles, departing from Rogers Park Middle School in Danbury at 7 p.m. and heading into Bethel before looping back. The local Ride of Silence is one of hundreds being held May 16 in towns and cities around the world to honor bicyclists who have been killed or injured on the roads, promote sharing the road, and provide awareness of bicycling safety. According to the Ride of Silence website, Chris Phelan organized the first ride in Dallas in 2003 after endurance cyclist Larry Schwartz was hit by the mirror of a passing bus and killed. To learn more about this year’s Ride of Silence events, see the organization’s Facebook page and website. In addition to participating in the local Ride of Silence each year, Cramer & Anderson has promoted cycling safety and honored Attorney Burke by donating cycling safety signs to western Connecticut municipalities in an initiative led by Partner John D. Tower. So far, signs have been donated to New Milford, Danbury, and Morris, the town where Attorney Burke’s fatal accident occurred. A cycling safety sign donated by Cramer & Anderson at the Litchfield/Morris town line near White Memorial. In presenting the signs to Morris officials in a September 2017 meeting, Partners Perley Grimes and Dolores Schiesel, an avid cyclist, recalled Attorney Burke as a Renaissance man who loved cycling, skiing, French cooking and photography, among other passions. 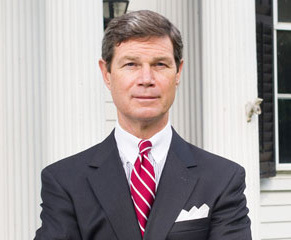 Attorney Schiesel showed the officials a photograph of Attorney Burke cycling with his daughter Victoria amid a dramatic high landscape along the Tour de France route in France. David Burke cycling on a portion of the Tour de France route with his daughter Victoria. 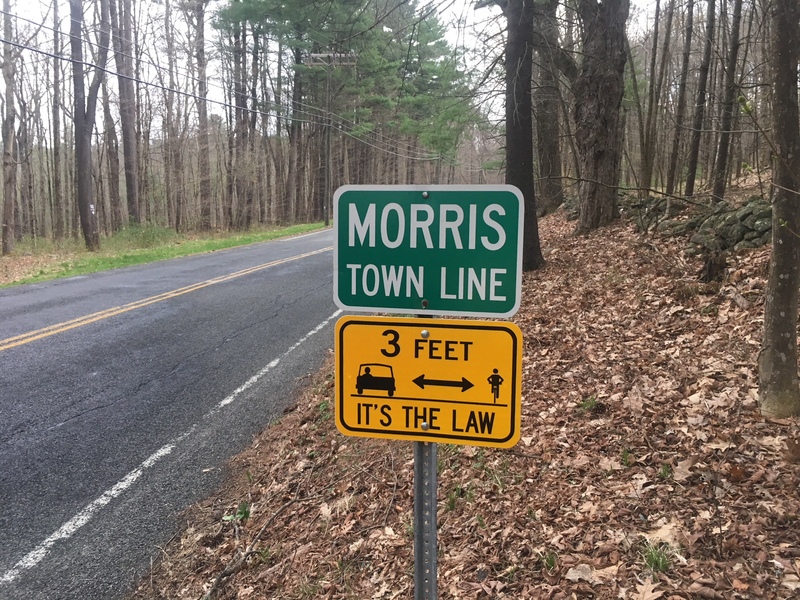 The reflective yellow roadside signs say, “3 feet – it’s the law,” a way of highlighting the Conn. Gen. Stat. § 14-232(a) requirement that motorists must respect the rights of cyclists and grant them a “safe distance” of at least 3 feet when passing. The statute says, “For the purposes of this subsection, ‘safe distance’ means not less than three feet when the driver of a vehicle overtakes and passes a person riding a bicycle.” The requirement was enacted in 2008. In New Milford, former Mayor David Gronbach and the Town Council accepted a donation of 10 signs last April, and last June the Danbury City Council unanimously approved accepting Cramer & Anderson’s donation of cycling safety signs. “David was a terrific person, an excellent attorney, a devoted father and bicyclist, and a close friend of ours, and we think this is suitable way to remember and honor him,” Attorney Tower wrote in an email to former Mayor Gronbach concerning the donation of signs to New Milford. Cramer & Anderson has offices in New Milford, Danbury, Litchfield, Kent, Washington Depot, and a new office in Ridgefield. For more information, see the website at crameranderson.com or call the New Milford office at (860) 355-2631.